Success in every aspect of your life is your aim; you do not wish to be defeated anywhere. 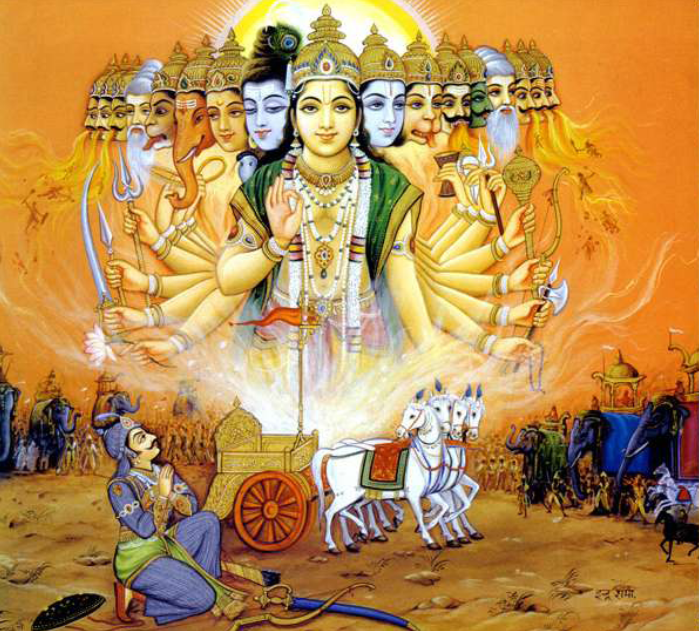 The Bhagavad Gita is divine song of God, It is the union of Arjuna and Krishna.The Bhagavad Gita is the essence of the Vedas. It is a universal scripture applicable to people of all temperaments, for all times. It is a book with sublime thoughts and practical instructions on Yoga, Devotion, Vedanta and Action. 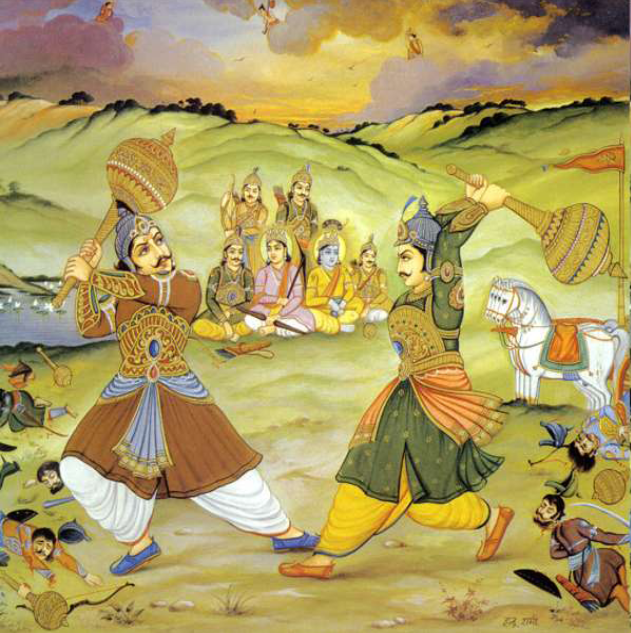 Two of the most significant passages of the Gita are Lord Krishna’s instructions to Arjuna on the nature of correct actions and the role of God in protecting his devotees. 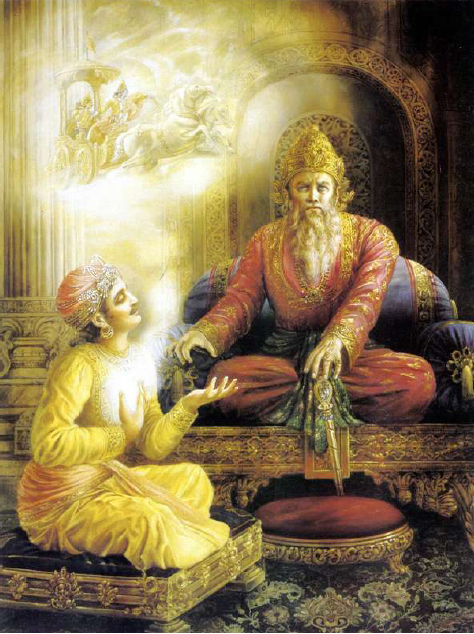 The Bhagavad Gita is a Royal Science of God-Realization. the cause of your sorrows. neither are you of the body. do it as a dedication to God. Whether the actions are good or evil and whether they are for yourself or for others, all actions are performed by nature and not by us. Nature has three attributes, namely, sattva, rajas and tamas or purity, passion and delusion, which perform all actions of the senses, body, mind and intellect. Since we are deluded by our ego, we think that we are performing these actions. Karma Yog is a science or wisdom that frees us from the bonds of actions and attachment with the attributes. According to the Bhagavad Gita, it consists of mentally renouncing the sense of doership in favour of God while performing all actions. This mental renunciation of all actions to God while performing them is called Karma Yog. It endows us with the supreme wisdom—the self-realization that we are God. Prakriti is said to be the cause behind the act, its instrument and its doer, while Purush is said to be the cause behind the experience of joy and sorrow. Purush, seated in Prakriti, enjoys the attributes born of Prakriti. The attachment with attributes is the cause of its birth in good and evil wombs. He who is united and knows the truth thus thinks, ‘I do nothing at all’ and in seeing, hearing, touching, smelling, tasting, walking, sleeping, breathing, speaking, releasing, seizing, opening and closing the eyes, believes that only the senses are moving among the objects of senses. Having crossed over these three attributes arising from the body, the dweller in the body is completely freed from birth, death, old age and sorrow and attains immortality. The person who does not have faith in this teaching of God and does not practice it will fail to attain wisdom and will be ruined. Renouncing all actions to Me, with consciousness of self-knowledge, free from hope and egoism, fight without mental fever. Those men full of faith who constantly practise this teaching of mine and without criticism, they, too, are liberated from actions. But those who find fault with this teaching of mine and do not practise it, ignorant in all Gyan [wisdom] and unintelligent, know them to be ruined. O Bharat, as the Avidwan [unwise] act attached to action, so should the Vidwan [wise] act unattached, wishing the welfare of the world. Whatever you do, whatever you eat, whatever you offer in sacrifice, whatever charity you do, whatever austerity you observe, O son of Kunti, offer all that to Me. Devoted to his own respective actions, each man attains perfection. How does each man, engaged in his own actions, attain perfection, that do thou hear. He from whom all the beings emerge and by whom all this is pervaded, by worshipping Him with one’s actions, does man attain perfection. A person does not have to change his lifestyle and actions to practice Karma Yog. All he has to do is to mentally renounce the sense of doership by thinking that nature/ God is performing all actions. He who thus worships the all-pervading Brahm by his actions will be freed from the three attributes of Sattva, Rajas and Tamas. 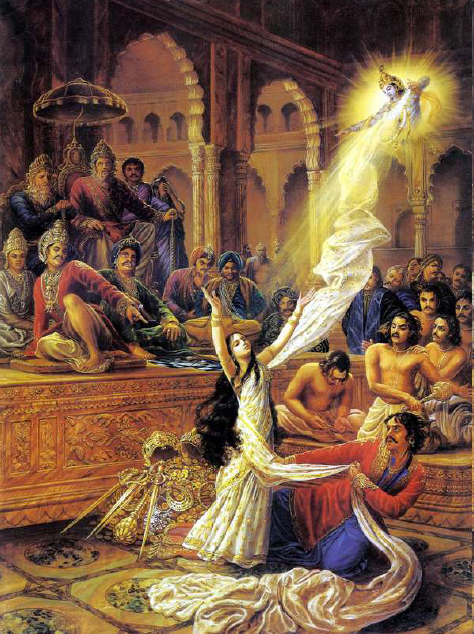 He will be liberated from sorrow, old age and death and shall attain immortality. 0.0.0.1 Success in every aspect of your life is your aim; you do not wish to be defeated anywhere. 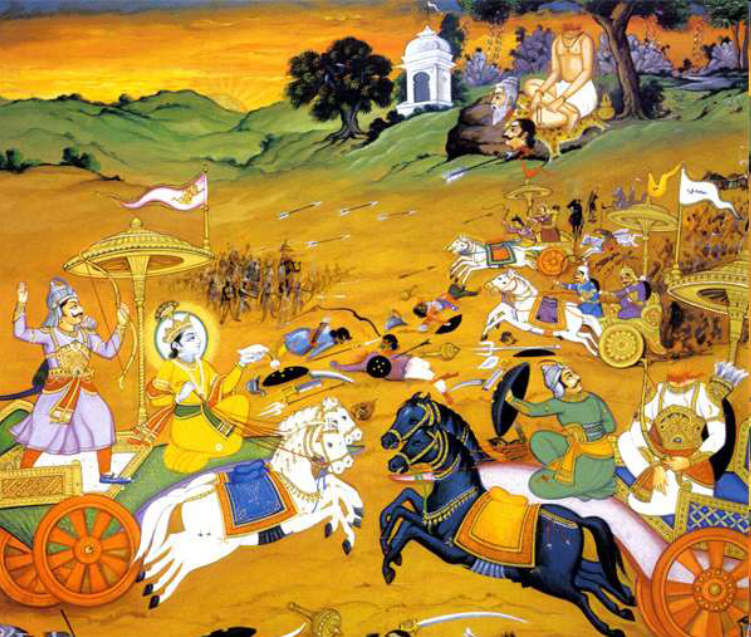 The Bhagavad Gita is divine song of God, It is the union of Arjuna and Krishna.The Bhagavad Gita is the essence of the Vedas. It is a universal scripture applicable to people of all temperaments, for all times. It is a book with sublime thoughts and practical instructions on Yoga, Devotion, Vedanta and Action. 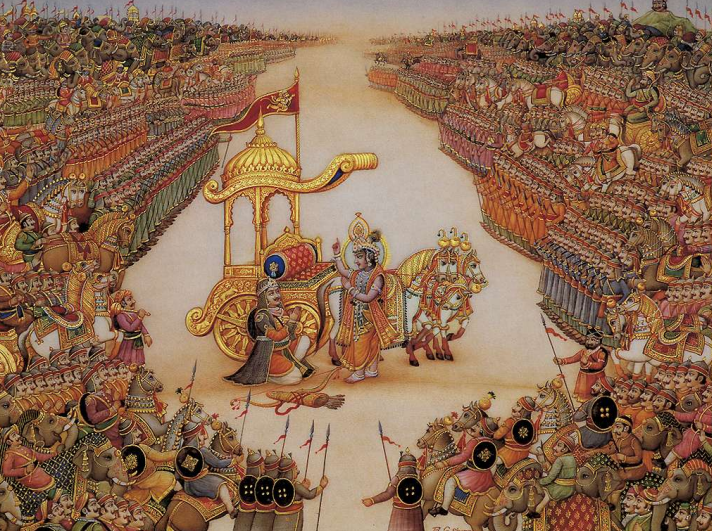 Two of the most significant passages of the Gita are Lord Krishna’s instructions to Arjuna on the nature of correct actions and the role of God in protecting his devotees. 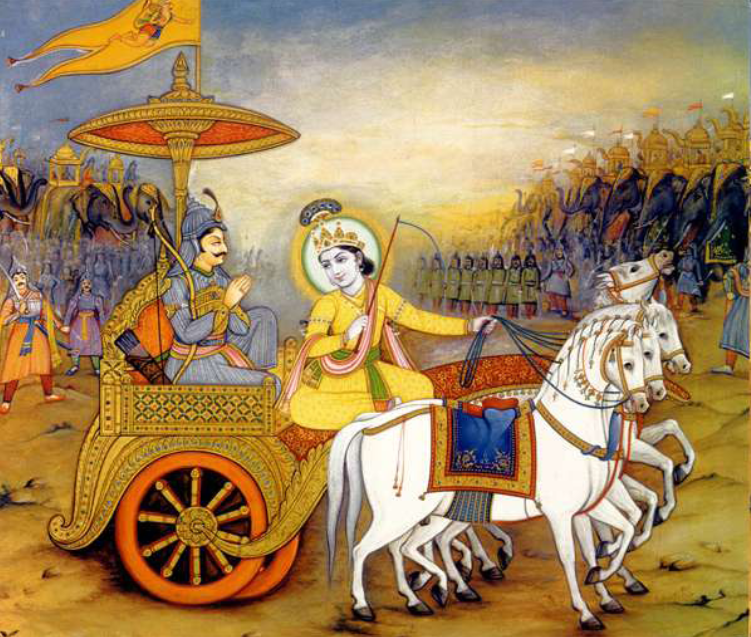 The Bhagavad Gita is a Royal Science of God-Realization. 1.1 Why do you worry without cause? Whom do you fear without reason? Who can kill you? The soul is neither born, nor does it die. 1.2 Whatever happened, happened for the good; whatever is happening, is happening for the good; whatever will happen, will also happen for the good only. 1.3 You need not have any regrets for the past. You need not worry for the future. 1.4 The present is happening… What did you lose that you cry about? 1.5 What did you bring with you, which you think you have lost? 1.6 What did you produce, which you think got destroyed? 1.7 You did not bring anything, whatever you have, you received from here. Whatever you have given, you have given only here. 1.8 Whatever you took, you took from God. Whatever you gave, you gave to Him. You came empty handed, you will leave empty handed. 1.9 What is yours today, belonged to someone else yesterday, and will belong to someone else the day after tomorrow. You are mistakenly enjoying the thought that this is yours. 1.10 It is this false happiness that is the cause of your sorrows. 1.11 Change is the law of the universe. What you think of as death, is indeed life. 1.12 In one instance you can be a millionaire, and in the other instance you can be steeped in poverty. 1.13 Yours and mine, big & small erase these ideas from your mind. 1.14 Then everything is yours and you belong to everyone. This body is not yours, neither are you of the body. 1.15 The body is made of fire, water, air, earth and ether, and will disappear into these elements. But the soul is permanent – so who are you? 1.16 Dedicate your being to God. He is the one to be ultimately relied upon. Those who know of his support are forever free from fear, worry and sorrow. 1.17 Whatever you do, do it as a dedication to God. This will bring you the tremendous experience of joy and life-freedom forever. 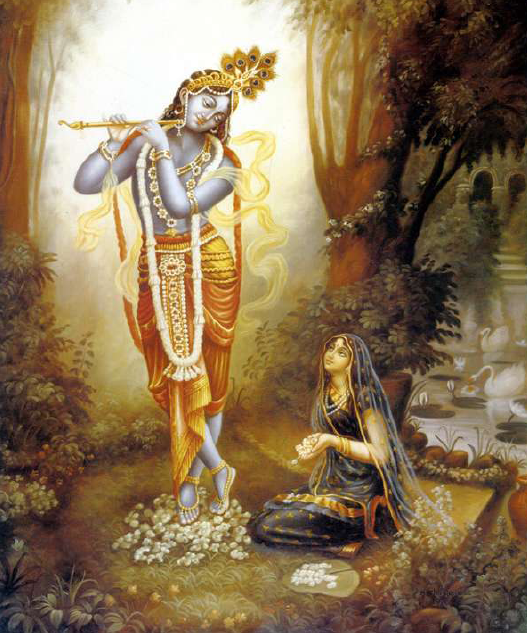 1.17.0.1 Whenever dharma declines and the purpose of life is forgotten, I manifest myself on earth. I am born in every age to protect the good, to destroy evil, and to reestablish dharma. 1.17.0.2 With a drop of my energy I enter the earth and support all creatures. Through the moon, the vessel of life-giving fluid, I nourish all plants. I enter breathing creatures and dwell within as the life-giving breath. I am the fire in the stomach which digests all food. 1.17.0.3 Those who remember me at the time of death will come to me. Do not doubt this. Whatever occupies the mind at the time of death determines the destination of the dying; always they will tend toward that state of being. 1.17.0.4 While contemplating the objects of the senses, a person develops attachment for them, and from such attachment lust develops, and from lust anger arises. From anger, complete delusion arises, and from delusion bewilderment of memory. When memory is bewildered, intelligence is lost, and when intelligence is lost one falls down again into the material pool. 1.17.0.4.2 He from whom all the beings emerge and by whom all this is pervaded, by worshipping Him with one’s actions, does man attain perfection.